Best Home & Property Services has a long history of experience in eliminating, preventing, and controlling dry rot in homes throughout South and North Carolina, including Manning, Marion, Dillon, Kingstree, Cheraw, Loris, Murrells Inlet and areas nearby. While dry rot is not the most common type of rot, it can deal serious damage to your home and endure conditions that are too dry for other types of rot to thrive. In fact, up to a 75% loss in the toughness of the wood is possible with just a 1% decrease in the wood's weight of the wood. The USDA Forest Service reports that just a 1% decrease in the weight of dry-rot-damaged wood can lead to a 75% loss of its the wood's toughness overall. Best Home & Property Services can help you eliminate dry rot problems at their source. We can dry your basement or crawl space, eliminate flooding problems, and seal out humidity. 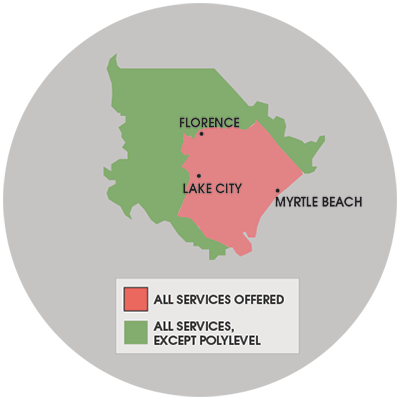 We service South and North Carolina, including Myrtle Beach, Florence, Sumter and nearby areas such as Conway, Lancaster, Hartsville, Georgetown, Darlington, Camden, Bennettsville.